Nestled in picturesque midcoast Maine in the beautiful town of Montville, Fernwood Nursery specializes in native and woodland plants hardy to this area. Gardening should be fun, so we carefully choose plants that do not need staking, spraying or extra mulch in order for you to have gorgeous plants that overwinter well. We have one of the largest collections of shade tolerant plants in New England, most of which are propagated here at the nursery. While we pride ourselves in our exclusive cultivars, you will also find plants from all around the world that have proven to do well in our climate. Hybridizing and evaluating numerous species, variants and cultivars of plants is an ongoing process that we truly enjoy at Fernwood. Alongside our nursery you can visit our lush display beds where we demonstrate how our plants can be used in an aesthetically pleasing way while requiring the least amount of care. These beds contain some plants that may not yet be available for purchase as we continue to test and develop our stock. No doubt, though, you will find some things you can’t live without among our hundreds of hostas, ferns, and wildflowers, many of which you’ll find only at Fernwood Nursery. When you visit our nursery, you will get a glimpse of our lives at Fernwood as we raise animals and much of the food we need to sustain us throughout the year. 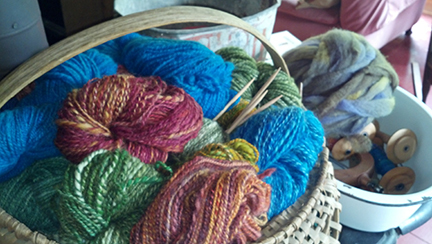 Perhaps you’d like a skein or two of the fiber that Denise has spun. You’ll find a lot of information on this site but nothing beats a visit. Come and see us. 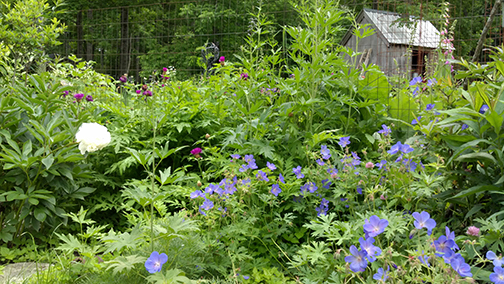 We’d love to chat about gardening, Maine and sustainable living. We would like to thank-you so much for letting us look at your hostas on your day off. We had been saying that we were going to stop at look at your hostas sometime….our sometime was this past Monday. We really enjoyed looking at the variety of plants you have. We plan another trip out, at your regular time open. Thank-you again for your hospitality. Wow! You are totally living my dream… I am in awe! This blog is utterly inspirational. Thank you so much for the follow; I feel like a charity case in comparison! Thank you! I am enjoying your blog as well and think you may be being too hard on yourself, from the looks you are doing amazing things , intent on creating sustainability in a small home. Love the potato post….who doesn’t love potatoes! Just heard a talk on NPR about de-cluttering ( you wouldn’t believe what I have saved!). The suggestion was to come up with a number you will allow yourself for saving a particular item. Like jars, do I really need 100 spare jars? ( Canning jars don’t count, we need those for sue). So I decide to keep a certain number and gift or recycle the remainder. I’m working on this! I think one of the best things about these blogs are the things we are able to share with one another, it’s a great medium for that. I’m looking forward to reading your blog! Thank you so much; that’s such a lovely reply! I’m a bit of a hoarder by nature and unfortunately ‘make do and mend’ encourages this quite a lot. But if I can give things away or recycle them, rather than bin them, it makes me feel better and afterwards, I actually feel ‘lighter’. Looking forward to your updates too – the lambs in particular! Hi Denise and Rick, Faye and I had a Blast Sunday playing in the Mud. I can’t wait to unmold my Hypertufa planter! Hello Jim and Faye, excellent, so glad you came! We had fun too, we always have such a great group for the hypertufa class. Keeping the class size relatively small, having both Rick and i available for help and questions, i think makes a difference. We loved having you……let us know how the unmolding goes. We do grow primulas and have some different varieties. Primula japonica is a great cultivar for a wet area and will also tolerate some shade. A visit to the nursery may help with making some decisions and we’d be glad to share ideas with you. Thank you for reading and see you soon!